For the cake: Sift the cake flour with the cocoa and 3/4 cup of the sugar into a large bowl. Using an electric mixer fitted with the whisk attachment, beat the egg whites with a pinch of salt until foamy. Sprinkle the cream of tartar over the egg whites and continue to beat until they hold a soft peak. Add the vanilla extract and gradually beat in the remaining 3/4 cup sugar, about 2 tablespoons at a time. Remove the bowl from the mixer and, using a spatula, gradually fold in the flour mixture, sprinkling in about 1/4 cup at a time. Pour the batter into an ungreased 9-inch angel food cake pan and bake until the cake springs back when pressed with your finger, about 30 minutes. Let cool for 1 hour, then loosen the cake from the sides and center of the pan with a knife before unmolding. For the strawberries: Combine the strawberries and sugar in a medium bowl and toss gently to coat every slice. Let the strawberries stand for about 30 minutes to allow the juices to develop. 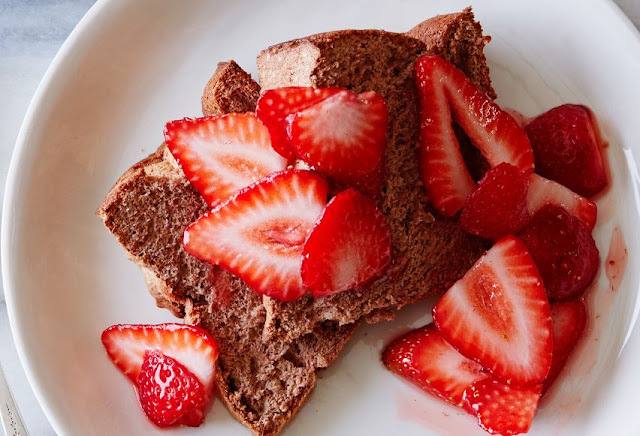 Serve over the chocolate angel food cake.